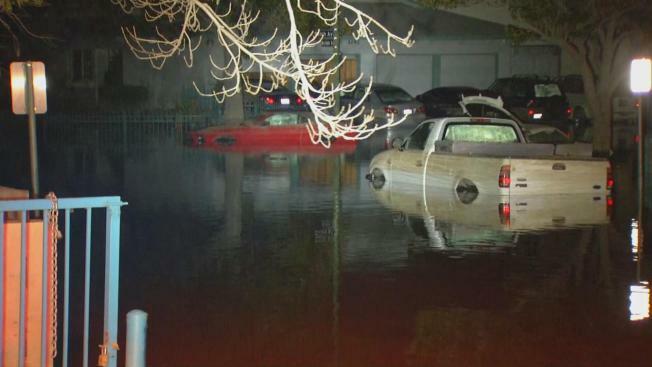 A month after floods devastated a San Jose neighborhood, rain returned to the Bay Area, but no overflows are expected this time around, officials say. On Monday, rainfall was relatively light, but by Tuesday, the William Street area of San Jose will see its first significant rain since flood waters quickly overtook homes, cars, streets and parks after Coyote Creek overflowed. The good news this time: Flooding is not expected. The city, however, is moving forward in case another storm arises where it would need to warn people. The historic floods last month brought water into Rob Souza's backyard and house, destroying a cottage on his property. "It was that quick, not even three hours," Souza said. With six weeks left in the rainy season, the city of San Jose has put a three-tiered warning system in place to make sure a lack of warning many residents complained about doesn't happen again. Under the new plan, a "yellow alert" would be sent out 48 to 72 hours in advance through news sites and social media if there is a possibility of flooding. If there's a likelihood of flooding, another "orange alert" would be sent 12-24 hours before estimated impact. If the flooding threat is imminent, a "red alert" would be sent out 4-6 hours in advance. At that point, officers and firefighters would go door to door evacuating people. The city would also use two loud-speakers to make announcements in English, Spanish and Vietnamese. Language barriers were one of the problems in warning residents of flooding along Coyote Creek in February. "Being in the military for 10 years, that sounds like something that probably should have been done," Souza said. "But since nothing was done, any warning at all would have been better." The latest storm, rolling in Monday night and Tuesday morning, is the first of three expected this week. Meantime, the Santa Clara Valley Water District continues releasing water from Anderson Reservoir in Morgan Hill, which was the culprit in the Coyote Creek overflow last month. The reservoir is at 86 percent of capacity, the district said, and officials expect it could hold twice the expected runoff from this week's rain. Lexington Reservoir, south of Los Gatos, could hit 100 percent capacity by Friday, the district said, but no flooding is expected. Many of last month's flood victims aren't concerned about incoming storms just yet. "After we get the inside redone to where it was before," Souza said, "yes, that would make me nervous, absolutely."